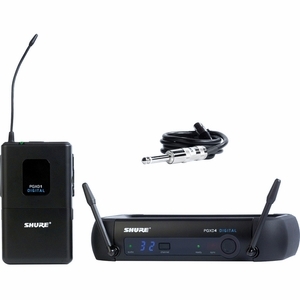 The Shure PGX Digital Series wireless systems combine the convenience of single touch remote channel setup with the reliability of 24-bit digital operation. Clean RF (Radio Frequency) performance, stable channel operation and low noise are all attributed to the PGX Digital's 24-bit / 48kHz digital operation. The user friendly yet rugged design of the Shure PGX systems measure up to provide years of reliable use in halls, houses-of-worship, clubs, theaters, restaurants, bars, etc. This system includes the receiver, bodypack transmitter and 1/4" phone instrument cable for use with guitar and bass.